Last week Alfa participated in the Spring Recruitment Fair organized by ESADE, an event aimed at BBA, Double degree in Business Administration and Law, MSc Programmes in Management and CEMS students. 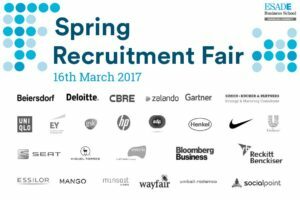 ESADE students were able to attend the various activities organized during this day and meet recruitment teams of companies from different sectors. For companies like ours, these events are a good opportunity to meet new talent, explain your company, tell about the professional opportunities offered and also to answer any questions the students may have regarding the company or the recruitment process. During the morning one of our consultants held a presentation where he talked about Alfa, what we do, our methodology, values, the projects we usually work with and shared his personal experience. Afterwards the actual fair took place, where all the companies gather in one space with their own booths. Our human resources team talked with numerous of walk in students and responded all their questions and doubts about their professional interests. Are you interested in working at Alfa? Read the 10 reasons why you should join us.